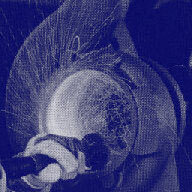 The abrasive grade is a measure of bond strength commonly known as ‘hardness’. For conventional wheels, grade ‘A’ is soft and ‘Z’ is hard. The structure governs the spacing of the abrasive, and those with the tightest structure (least porosity, highest density) have a structure number of 1 or 2. Less dense wheels numbered up to 15 have much higher porosity. Even higher numbered wheels can be achieved using the induced porosity technique during manufacture (see extra porous wheels).